בָּתֵּי הַקְּבָרוֹת מְרִיחִים כְּמוֹ אָבִיב. תּוֹעִים מֵעוֹלָמָם לָמוּת אֶל הָעוֹלָם. הֵם חוֹלְפִים עַל פָּנֶיךָ כְּמוֹ הָיִיתָ רוּחַ. עִם כָּל נְשִׁימָה אַתָּה שׁוֹאֵף נוֹכְחוּת. בָּאָבִיב הַכֹּל שׁוּב מִתְגַּלֶּה בַּבָּשָׂר. מַרְאוֹת נוֹצְצוֹת תְּלוּיוֹת בָּרוּחַ עֵינַיִם פּוֹרְחוֹת בְּכָל מָקוֹם. duften die Friedhöfe wie Frühling. verirren sich aus ihrer Welt	um hin zur Welt zu sterben. sie ziehen an dir vorbei	als seiest du ein Geist. ist nur ein hauchdünner Vorhang	kein Schutz. Mit jedem Atemzug ziehst du Gegenwart ein. Im Frühling wird alles wieder offengelegt im Fleisch. Im Wind hängen glitzernde Spiegel	Augen blühen an jedem Ort. to die into the world. when they move on past you as if you were a ghost. is a thin curtain powerless to shield you. Sounds of bells and sea-shells come close to your ears. Every breath you take is presence. In spring everything reveals itself in flesh again. Glittering mirrors are hanging in the wind eyes blooming everywhere. The poem was written parallely in Hebrew and English. los cementerios huelen a primavera. para morirse en el mundo. cuando pasan cerca de ti como si fueses un fantasma. es una cortina delgada incapaz de protegerte. Sonidos de campanas y conchas marinas se acercan a tus oídos. Cada respiro es una presencia. En la primavera todo se revela en carne y hueso nuevamente. Espejos relucientes cuelgan en el viento ojos florecen por todas partes. przywołane z zaświatów żeby tutaj umarły. kiedy przechodzą obok jakbyś nie istniał. Posłuchaj – coraz głośniej biją dzwony, morze szumi w muszlach. Każdy twój oddech mówi, że jesteś. Wiosną znów wszystko staje się ciałem. Lusterka z blach dzwonią na wietrze oczy zakwitają wszędzie. 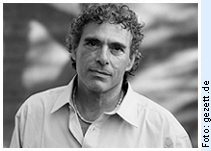 Amir Or (b.1956 in Tel Aviv, Israel), poet, translator and publisher, is one of Israel's most popular writers. He studied Philosophy and Comparative Religion in Jerusalem. The philologist's interest in Greek mythology is reflected in his poems, which have appeared so far in eight collections and have been translated into more than thirty languages. “The Song of Tahira” is an epic novel in metrical prose, while his poetry collection Day takes the Jewish Book of Prayer as its starting point and interprets it in his poetry, Or experiments with all the dialects of the ancient cultural language that is Hebrew in order to show the various periods in the development of languages. Amir Or is the initiator and organiser of the Helicon Society for the Advancement of poetry in Israel, which has given its name since 1990 to a poetry journal, a press, a festival and an Arabic-Hebrew school for poets. Amir Or is Israel's representative in the 'Poets for Peace' project promoted by the UN and has taught Creative Writing at many universities. He has received the Prize of the Prime Minister of Israel, the Bernstein Prize and the Holon Prize for his work. Amir Or is the Artistic Director of Helicon Society, which organises the Helicon Festival, Hebrew-Arabic poetry workshops and produces Helicon Poetry Magazine.